We are a full-service heating company offering installations, maintenance, and repairs for all kinds of oil heating equipment. To keep your oil-fired furnace or boiler running at peak efficiency, we provide annual maintenance and other valuable services. Our team of professional service staff and technicians is the best in our Central Massachusetts service area; no one offers a more experienced staff nor can they match our courteous service. Did you know that having an annual tune-up and safety check performed on your heating system each year can save you up to 10% on your fuel costs? Ensuring your equipment is operating correctly can reduce the risk of breakdowns and can allow your system to maximize fuel efficiency. If you are in need of repair throughout the year, our service technicians are experienced in servicing all types of oil and gas heating systems. It is our priority to keep your home and family warm and safe in any condition 24/7 365 days a year. 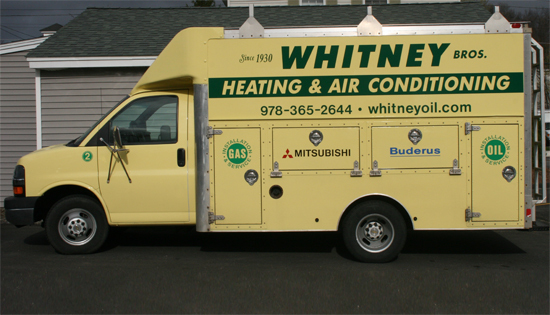 If you experience heat loss or a system malfunction at any time of day or night, you can call on Whitney Plumbing, Heating & Air Conditioning. As your local service provider, we will be on site promptly to restore heat to your home as safely and quickly as possible! If your current oil-fired heating equipment is 15 years old or older, you can save up to 30% on your fuel bills by upgrading to a new oil heating technology. Installing a new oil-fired boiler or furnace is an effective way to reduce your home heating costs, increase the value of your home, and improve your overall home comfort throughout each heating season. We can help you determine the oil heating equipment that will be best for your home comfort. You may also be eligible for state rebates for your energy-efficient upgrade! Mass Save® is offering 0% financing and rebates of up to $2,300 on ENERGY STAR qualified heating systems! Our staff is here to help determine the best fit for your new heating equipment upgrade, so please contact us to discuss the ENERGY STAR approved products we offer that will keep your home comfortable this winter and for years to come.